Americans aren’t the only people obsessed with barbecue sauce. Grill masters across the world have endeavored to create the ultimate barbecue sauce ever since we started roasting meat over live fire. Argentineans could no more imagine grilled beef without Chimichurri than Thais could enjoy saté without peanut sauce. In Spain, grilled fare comes with a roasted vegetable and nut sauce called Romesco, while in the Republic of Georgia, no barbecue would be complete without a condiment made with sour plums called Tkemali. This blog explores the lip-smacking world of barbecue sauces. Down in Central America, order a steak in a Honduran or Salvadoran restaurant and you’ll be offered a small bowl of a spicy tomato sauce called chirmol. At first glance, it looks like Mexican salsa, but the flavor profile is quite different—the result of adding oil and vinegar in addition to the lime juice. There are many types of chirmol, including a salsa-like uncooked version and a cooked one made rich with roasted vegetables. The global barbecue trail also abounds with fruit-based barbecue sauces. Few are as distinctive as Asia’s mam nem, Vietnamese pineapple-shrimp sauce. Pineapple, shrimp, and fish sauce (sometimes anchovies are used) may sound like odd bedfellows—until you stop to think that American steak sauces often contain tamarind and anchovies. The sweet and salty flavors go great with grilled foods of all sorts, be they Asian or Western. In South America, many sauces are designed to be spooned over grilled meats, especially steak. Pebre, a spicy herb-scented salsa, is Chile’s national table sauce. 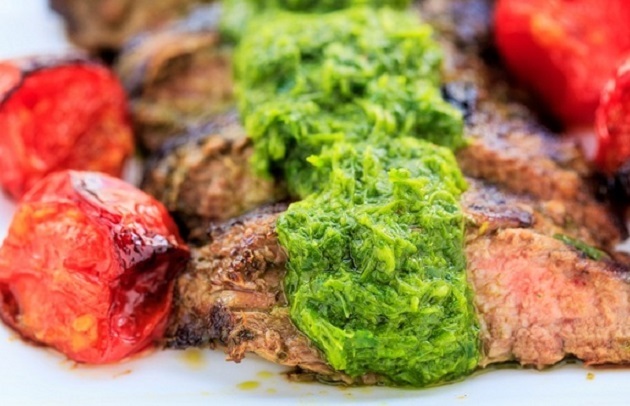 It may remind you of Argentinean Chimichurri, but it differs in several key ways. One is the use of cilantro in place of parsley. Another is the use of a fiery green Chilean chile that tastes a little like a Scotch bonnet. Across the pond, the Catalan sauce, Romesco, is one of the most distinctive grill sauces in Europe—a thick purée of charred vegetables, chiles, and nuts spiced up with a Spanish dried chile called nyora—or ñora. It isn’t particularly pretty to look at (like most Catalan dishes, it’s brown). But it’s hard to imagine a grilled food—be it from sea, land, or air—that wouldn’t shine in its presence. Over in the Oceania region of the globe, the people of Guam traditionally accompany chicken and pork with a salty-tart vinegar-soy barbecue sauce called Finadene. When it comes to counterpointing the fatty richness of barbecued pork or adding tart umami flavors to grilled seafood, few sauces can beat it. Finadene (pronounced “fee-na-DEE-nee) echoes the Filipino flavor triad of soy sauce, vinegar, and onion, but with tiny fiery chiles for heat. Some versions are quite mild; others downright incendiary. Finally, spend time at a South African braai (barbecue) and you’ll experience one of the most curiously named condiments in the world of live-fire cooking: Monkey Gland Sauce (fear not: No primates perish in its preparation). The very notion might alarm a North American, but for a South African, nothing tastes better at a barbecue than this sweet-spicy blend of chutney, wine, and hot sauce. This sauce is customarily served warm or at room temperature, with grilled meats, such as steak and lamb chops. As you can see, the world of barbecue sauces is varied and plenty, full of interesting flavors and exotic ingredients. 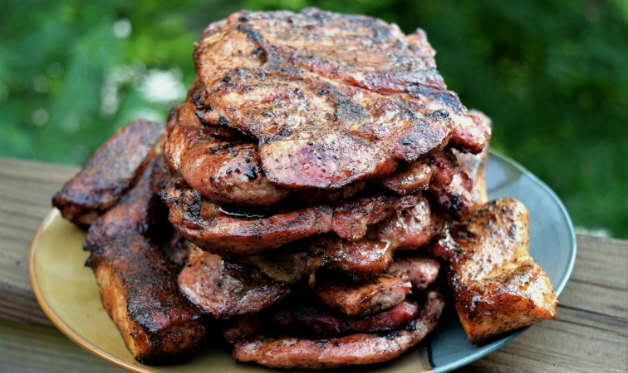 Exploring these tastes from around the world accompanied with meats and vegetables cooked over a live fire is one of the true pleasures of Planet Barbecue.